Is the Bull Terrier right for you? Find your perfect match now! Bull Terriers have kept presidents and princesses company: Theodore Roosevelt owned a bull terrier; and Princess Anne owns two. This distinctive looking dog is—as the name suggests—a result of a cross between a bulldog and a terrier. Their head shape is unique and they're the only breed with triangular eyes. Sometimes lumped in with other bully breeds, Bull Terriers have been the targets of breed-specific regulations in some states. Originally from England, this medium-sized and high-energy breed can grow to between 50-70 pounds and lives an average of 11-14 years. The breed is recognized by the American Kennel Club and classified as a member of the Terrier group. WHAT IS A BULL TERRIER'S PERSONALITY LIKE? This charismatic canine makes a delightful, albeit unique companion. Fans have described the Bull Terrier as a toddler dressed like a dog — they're friendly, busy, and inquisitive. Bull Terriers are also playful pups who delight in amusing their people with clownish antics. Don't be surprised if you come home and your Bull Terrier has done something odd — these guys love to get into mischief when bored. This active and social breed is devoted to their chosen people, and will do best with older kids. They're usually amiable toward strangers. 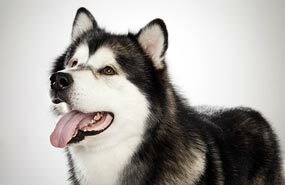 They can be suspicious of other dogs but can get along with other pets and small animals. WHAT IS BULL TERRIER BEHAVIOR LIKE? The Bull Terrier is, for his weight, the most muscular dog breed and will need consistent daily exercise. But with enough activity — think long walks, rigorous games, or short jogs — Bull Terriers make for a relaxed and vigilant house dog. They're watchdogs who are very motivated to protect you and your home so can be somewhat prone to barking. HOW EASY IS IT TO TRAIN A BULL TERRIER? 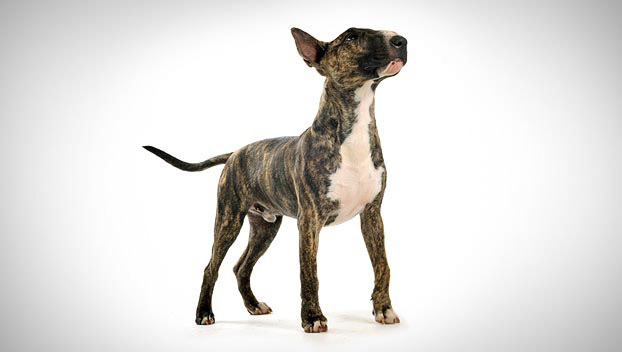 Bull Terriers are quick learners but can be resistant to training — they're intelligent and have strong personalities. You can't strong-arm this dog into line. Start early and be patient and consistent with your pup. This breed responds best to reward-based and structured training. Obedience training will help your Bull Terrier to be a good canine citizen and keep their active minds engaged. Early and frequent socialization will make it easier for Bull Terriers to get along well with other dogs and children. HOW MUCH DO BULL TERRIERS SHED AND WHAT ARE THEIR GROOMING NEEDS? Bull Terriers don't require much in the way of grooming. They're average, once-a-year shedders who require only an occasional brushing and baths as needed. Bull Terriers have single coats that are tight and short. Scientifically speaking, there's no real chemical difference between hair and fur — they're both made of keratin (the same stuff your hair and fingernails are made of). If you're concerned about allergies, choose a breed that doesn't shed much and produces less dander. WHAT HEALTH PROBLEMS DO BULL TERRIERS HAVE? Bull Terriers are a generally healthy breed. Some develop epilepsy, knee trouble (patellar luxation), kidney and heart problems, and skin allergies. Be sure to have your Bull Terrier puppy's hearing tested. This breed is also prone to compulsive behaviors, like tail-chasing. ARE BULL TERRIERS GOOD FOR PEOPLE WITH ALLERGIES? The American Kennel Club doesn't list Bull Terriers among its breeds recommended for allergy sufferers. You can reduce your furry friend's impact on your allergies with frequent baths and brushings to reduce loose hairs and aggravating proteins in your pet's dander. Use a damp cloth to wipe off your dog after you've been playing outside. Smaller dogs have less surface area, and so produce comparatively less dander than larger breeds — definitely something to keep in mind with a dog like a Bull Terrier! Remember that no breed is 100% hypoallergenic, and any breed can aggravate allergies. WHAT'S A BULL TERRIER'S BEST DAY? If left to her own devices, probably finding some high-up point in your home that you'd never think they could reach—and scaling it. Then waiting for the look on your face when you get home. SHOULD I ADOPT A BULL TERRIER? This is a wonderful breed, but Bull Terriers are definitely not for novice dog owners. Happy Bullies need room to run, company, training, and socialization. This active breed needs lots of exercise. They want to be with you, whatever you're doing (though they're not particularly cuddly). They'll keep you company while you jog and protect you and your home. They can be stubborn during training but will benefit from the mental and physical stimulation. If you can commit to training them and keeping them well-exercised, you won't find a funnier or more devoted companion. Have you decided that a Bull Terrier is the perfect dog for you? Why not be your new best friend's hero and adopt a rescue! Be sure to check out our article on what to expect when you're adopting a dog or cat.